Thought Gow had a good game. His end product can be lacking when trying to score but overall he was certainly one of our more effective players. Delighted to see Mortimer and McLean thrive at their respective wing back roles, both looking comfortable and effective. Think blaming mckernon for the goal is a bit harsh, the boy took his goal well and if anything I thought Gerry was more at fault. Some tough games coming up but if we keep playing in the same manner, we'll pick up more points than not. Jesus forgot about Seb Useless. Old was definitely a Kiwi. Steven Old is a blast from the past just looked him up 9 years ago he played for us! Has since played in England, Sweden and China has spent the last few seasons with Morecambe. 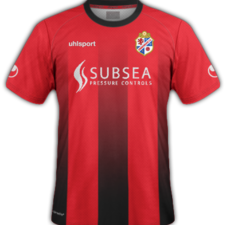 It was a Cowdenbeath fan who was the sponsor. Honest! No surprise to see QP get another penalty. Can't think of any other team in the SPFL getting as much luck with penalties as this mob. You can't one not too far away from there!! What a ridiculous tackle to put in for the penalty. It’s in such a position there is absolutely no need to dive in. Great finish from Henvey, something we don’t really have is real composure in front of goal so hopefully he gets a run of games. Cold. Shite. Tough conditions. Next. He was very lucky to get away with one not long before. Pyper is good for at least one heart in mouth moment every game - yesterday there was several. Poor game. We struggled down the wings yesterday, our full backs were left completely exposed too often. Looks like he cost us the 3 points. Must not start next game. Idiot. Yes it does. Unfortunately the individual's knowledge of the game didn't quite match his good grace. Quote: " Is that Gow that used to play fur The Bairns? Only yin I ken in this team." Simples. Hardly a side brimming of household names who has any at our level. Could have been worse could have been "used to play fur Rangers"
Strange that he didn't know former Cowden player Gerry? Or maybe he's wiped that spell from his memory. I've tried.